In 2016, focusing on the customer experience was the top priority for many companies. It makes perfect sense – If a customer has a great experience, they are more likely to be happy. And as we know, happy customers mean loyal customers. But, when it comes to customer service, we either receive good customer service or poor customer service, right? It’s usually one or the other. It’s very rarely OK. It’s almost like a love/ hate relationship. But, it’s something that we, as business owners, can all improve upon and it is the one thing we can always do better than the competition. We can always deliver a greater customer service. So, when Forrester Research announced their top trends for customer service, everyone involved in customer service was listening to what was being shared. Knowledge Will Evolve From Dialog To Cognitive Engagement. Predictive Analytics Will Power Offers, Decisions, And Connections. Wait a second – Proactive engagement? It’s not like customer service teams don’t have enough to do already by handling calls, emails and social media messages, but now one of the biggest customer service trends is to be more proactive with customers. I mean, how on earth are we supposed to find the time? Fear not. I have the answers for you as in this post, we’ll take a look at the benefits of proactive support, how important it can be for your business and I’ll provide you with five ways to get started. But before we begin, let me explain what proactive engagement (or proactive support) is. Proactive customer support is about identifying and resolving customer issues before they become problems. There are two buckets of customer service; you either fall into the proactive bucket or the reactive bucket. Reactive customer service: A customer is browsing your web store and has a question. Typically, they find a contact page, call or email you and wait for a response. Proactive customer service: It means anticipating customer issues and addressing them proactively. This can take a number of forms from FAQs and forums to knowledge base and instructional videos. Most customer support teams fall into the reactive box, but in order to truly get your customers to live for your brand, you need to be proactive. Why is proactive support important? Proactive customer support offers a number of benefits for your business. Control communication – Customers will talk about your brand to their friends and their family in private, but they will also talk about your brand in public via social media. By being proactive, it gives you the chance to be involved in their conversation and engage with them in a way that puts your business in the most favorable light. That being said, how will your customers themselves feel about proactive support? Well, apparently they will like it. A lot! 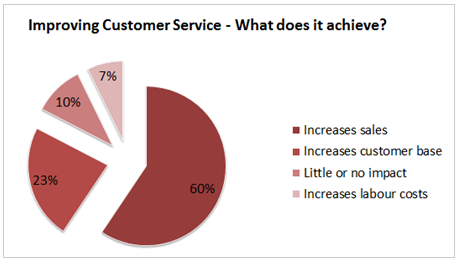 A study by inContact found that consumers were generally positive with proactive service. 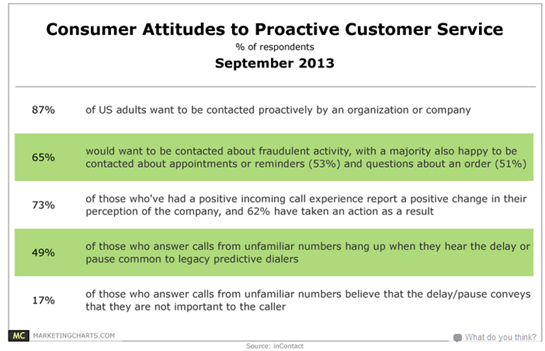 In fact, 87% of adults surveyed are happy to be contacted proactively by companies regarding customer service issues. And not only that, the survey also found that 65% of consumers are open to being contacted about fraudulent activity on an account, 53% are open to setting appointments or reminders and 51% are open to being contacted for questions about an order they placed. Furthermore, 75% of respondents who had a pleasant surprise or positive experience with an incoming call reported a positive change in their perception of the company calling them. Proactive Customer Service presents the opportunity to meet and exceed customer expectations, strengthen customer relationships and boost the value of your customers through both their business and their advocacy. Here’s how proactive support can benefit your business. Acquire new customers. By being proactive, you can find opportunities to reach out to prospective customers, and encourage them to switch to your brand. Retain existing customers. Proactively reaching out to your customers, even when they haven’t directly mentioned you, can deepen those relationships. With more of your customers turning towards social media for customer service, you have to move a step ahead to break their expectations of good service. Create Advocates. Proactive customer service offers the chance for you to not only turn around unhappy customers, but turn them into brand advocates, as a happy customer will tell at least 3 people about their experience. Protect against escalation. Looking to identify negativity surrounding your brand at the earliest warning is the best way to protect yourself against a social crisis. Research by Altimeter found that the number one cause for complaints online was due to poor experiences. Still not convinced that proactive support is the way forward? Anglian Water sends more than 200,000 SMS messages and emails to their customers every year to notify them of outages and problems in their area. By doing this, it helps them dramatically reduce customer calls and through this one initiative, they have reported saving between £100,000 and £200,000 in call center costs every year! How can you move from reactive to proactive support? So how do you shift from reactive customer service to proactive customer service? Well for starters, it’s easier than you think. Firstly, it doesn’t have to be time consuming or expensive. And secondly, it’s important to remember that the driving force behind shifting to a proactive service strategy is that by doing so, you’re putting your customers first. Make yourself available. This means more than just leaving a contact number on your website (41% of companies currently do not make this information visible). It means being available across a range of communication channels, such as phone, email and social media. 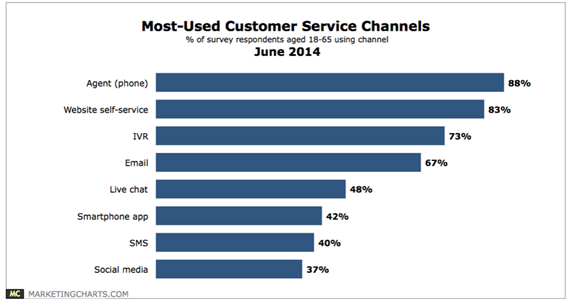 By letting customers get in touch with you in the channel of their choice, it lets you serve them more effectively. Help your customers help themselves. Allowing your customers to help themselves and answer issues empowers the customer. For example, this can include creating an FAQ section on your website or alerting your customers of existing issues that they can troubleshoot themselves through a step by step guide. Putting your customers first will increase your brand’s reputation and ultimately, your bottom line – As 60% of brands report an increase of sales when improving customer service. Putting your customers first will prove extremely beneficial to both your reputation and your bottom line, and the costs will cover themselves. While being reactive in customer service might satisfy the customer, it won’t necessarily surprise or delight them. Now, imagine if you can solve a problem before the customer has to call you. Or even better, if you could solve an issue before the customer was even aware of it? Well, proactive support is not only possible, but doing it is surefire way to increase profits! And to help you get started, we’ve created five specific actions you can take to start wowing your customers and to shift from a reactive to proactive customer service. Customer service is about giving customers what they want, but first, you first have to find out what that is – And there’s no better way than to ask them. Companies that frequently check in with their customers can easily identify areas of weakness and correct them before customers become unhappy. So how do you collect feedback from your customers? If you’re not paying attention to what customers are saying about you online, you’re missing key opportunities. Reaching out to customers who mention your company on social media, whether the conversation is in a good or bad context, allows you to address a customer’s need and increase satisfaction. Recent research conducted by New York University found that more than 37% all Tweets were customer service related (this includes positive and negative tweets). To put that into context, there are 500 million tweets per day. That’s a huge opportunity to turn unhappy customers into happy customers! A great example of this is when Morton’s Steakhouse discovered that popular blogger; Peter Shankman sent a tweet suggesting they deliver a steak to him at the airport when he landed. To his extreme delight, a Morton’s employee was waiting for him when he landed, steak in hand! Who wouldn’t be delighted with that kind of service? And when it comes to customer complaints, you can respond with an apology and make sure you include a description of what you are doing to fix the problem. Offering rewards for regular customers is a powerful loyalty-building tool. And just behind exceptional customer service, rewards and offers are both the second and third best way to build customer loyalty. Rewarding offers proactively to customers in between purchases provides an additional positive interaction with customers to strengthen your relationship with them. It can also solve problems customers that they were not aware they had by informing them of something they may be missing out on and offering a way to fix this. For example, sending an email to a customer 30 days prior to their subscription renewal and offering a 5% discount to thank them for their business is likely to result in the customer staying with your business – And it also means that they don’t have to call or email you, which will increase their satisfaction. It’s always better for customers to hear about a problem from you instead of realizing it when your product or service doesn’t do what they need it to, when they need it. For example, if you’re scheduling a software upgrade, inform your customers before the upgrade takes place to that they are aware of it, as oppose to finding out on the spot that they cannot log in and access the information they need. Many customers prefer to find answers to their problems themselves rather than having to call or email a company as calling customer service can be frustrating at times, especially when you cannot reach the right person. And while contacting customer service by phone remains the most-used customer service channel at 88%; but self-service is a close second. One of the easiest ways to satisfy your customers is to make answers to common questions easy to find. You can identify these questions by talking to your customer service or sales teams and by reviewing customer service calls and email logs. You can then group the answers in one place, such as an easy-to-find and read FAQ section on your site. Proactive customer service doesn’t just allow you keep the customers you have happy – It helps turn your customers into brand advocates, which is an incredibly powerful marketing tool to help drive new business. And while the five tips listed above aren’t the only ways to be proactive in servicing your customers, they are the best starting point in taking the initiative to increase satisfaction, loyalty and revenue. Are you proactive in the support you deliver? What are some of benefits you have seen since shifting from reactive to proactive? P.S. Get a head start in being proactive by downloading the customer service email templates guide. It's all about anticipating your customers. Paying full attention like monitoring customer's conversations, contact with them to check out the things are working properly, help them by providing live chat option will be very useful for proactive support. And the most important thing is to monitor how your customer is using your product or services. 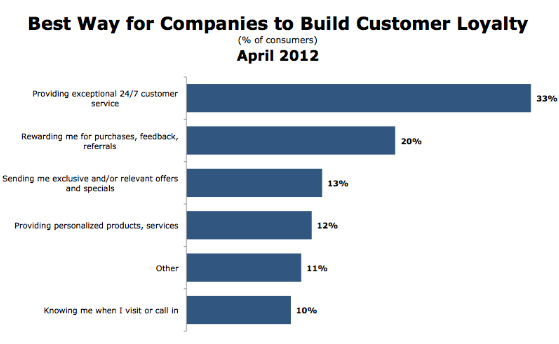 So, you can take initiative from these points in order to increase loyalty and revenue. Great comment, Charles! And that's a really good point about taking initiative to increase loyalty and revenue. I agree with you, Steven. When it comes to brand loyalty then it is mostly about knowing your customers and their needs better. Once their needs have been comprehended then the predictability of the customers also increases. With predictability come actions and if the action is at all meaningful for the customer then brand loyalty comes on its own. Excellent comment, Vipul! I completely agree. Great article. Thanks! There is no harm in answering only when you are asked. But through proactive support, it’s far better to reach to the customer for solving any problem even before he or she asks for it. Here I would like to add one point : adding live chat on your website. There are several advanced features a live chat offers. One of them is ‘Proactive Chat’. Connecting with your customers has become easier with ‘Proactive Chat’. It lets you reach to the website visitors for offering instant help even before they ask a question. Competition is at the peak now, and customers have a high bargaining and switching power. Therefore, proactive support becomes the competitive advantage of modern day businesses as it will increase customer satisfaction, retention, and loyalty. You nailed it, Eric. Well said!